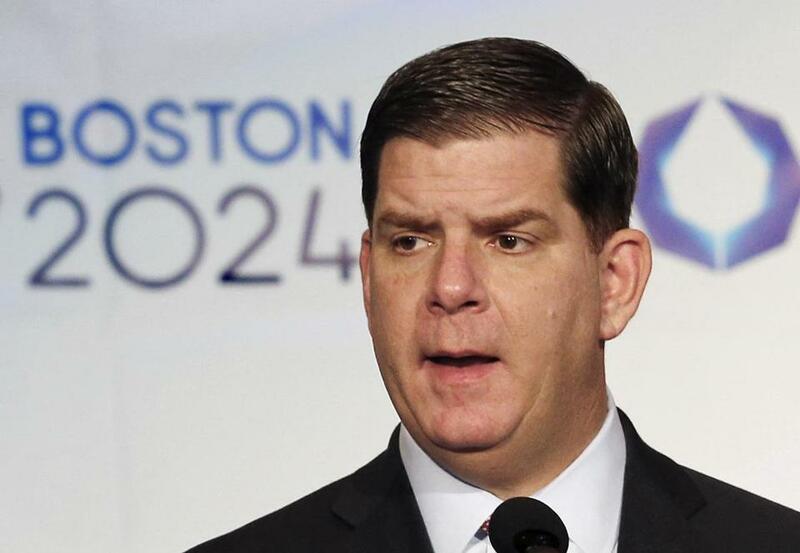 Mayor Martin Walsh’s Imagine Boston 2030 planning blueprint addresses some of the same needs the Olympics might have. The fanfare this week around the selection of Los Angeles as host of the 2028 Summer Olympics provides a taste of what Boston lost when it abandoned its bid for the Games in 2015. Mayor Eric Garcetti of Los Angeles announced the agreement Monday, which, if ratified by the Los Angeles City Council and the US Olympic Committee board in August, would make LA a three-time Olympic city after hosting the games in 1932 and 1984. That’s cause for congratulations. In Paris, a likely host for the 2024 Olympics, officials gave LA a hearty “mission accomplie” but said talks on any Paris Games would continue throughout August. 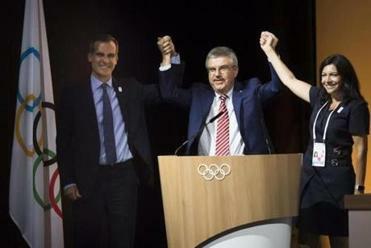 The final vote of the International Olympic Committee is scheduled for Sept. 13, in Lima. As a chance for a city to strut before a world audience, the Olympic Games have no parallel. London 2012 helped reinforce London’s transformation from a fusty imperial capital to a multicultural global crossroads. The opportunity to move Boston beyond gangster films and Freedom Trail platitudes, and reintroduce the nation’s oldest big city as the educational and research powerhouse it has become, was a key part of the appeal of the failed 2024 Olympics bid. The proposal for a walkable Olympics would have left an enduring imprint on the city’s physical form, and held out the promise of bringing together disparate and sometimes fractious communities and neighborhoods through the transformative power of sports. The unusual decision to consider two Olympic cities at once — including Los Angeles, which took Boston’s place as the American entry — also suggests a positive turn for the IOC, a signal that it wants to win back the favor of Western democracies. If Boston’s bid had proceeded, it surely would have prevailed. Although much of that discussion has abated, the forward-looking planning and commitments that the Olympics might have spurred can be addressed in the 2017 mayoral campaign. One example: The plan that was on the table at the time the bid was scrapped would have turned Widett Circle into a new neighborhood, by constructing a massive deck over the railroad tracks there. It was a transformative idea then, and remains one now. For Boston, the Games also offered a once-in-a-lifetime chance to galvanize investments in housing and transportation; to modernize the MBTA; to complete an Emerald Necklace that was supposed to reach Dorchester Bay; to resolve, at long last, the traffic horrors of Kosciuszko Circle. Paris is the only city left to host the 2024 Summer Games. These are still challenges worth accepting. Fortunately, Mayor Walsh’s new Imagine Boston 2030 planning blueprint addresses some of the same needs that the Olympics might have. That plan calls for developing Widett Circle, and, like the Olympics plan, for greening Columbia Road. The test will be whether the city can implement those plans without the hard deadline the Olympics would have provided. Los Angeles, which has hosted the Summer Games twice and will mostly use existing facilities in 2028, was well poised to take advantage when talks in Boston broke down. In its agreement with the country’s second-largest city, the IOC also implicitly acknowledged the benefit of sweetening the pot for host communities. For 2028, the IOC has also agreed to give Los Angeles an immediate $180 million advance, which is expected to cover the organizing committee’s costs and rejuvenate youth sports programs with new funds. By passing on the Olympics, Boston likely lost its chance to host the world’s biggest sporting event for at least a generation. But maybe someday a different IOC will be able to come to terms with a future Boston, and give the world a better, smarter, more inspiring Games than what we might have had in 2024.